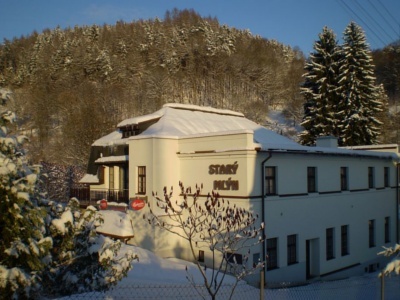 The Old Mill Hotel and Guest House is situated in a suburbs of a town Železný Brod, in a beautiful Valley of the Stream Žertovník, which is flowing directly under the Summer Terrace. The town Železný Brod is situated in a colourful Valley of the River Jizera, between The Jizera Mountains and the Czech Paradise. There are woods around, where you can walk. There is a big Sports and Culture Enjoyment in the Neighbourhood- Swimming Pool with a Switchback, Tennis Courts, Mini-golf, Rafting, Fishing, Picking Mushrooms, Hiking, Cycling, Climbing, Skiing, Snowboarding and other.